There is recorded to have been a gallows on Burton meadow dating back to 1012 – before the Norman invasion. 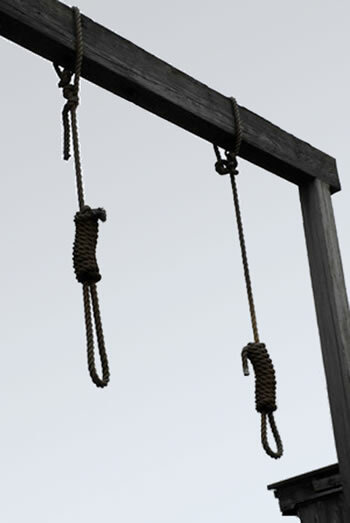 In 1293 the Abbot successfully claimed the right to use a gallows. There was a gallows on the parish boundary with Tatenhill by 1395. The bridge which carried the road south from Branston village over the boundary brook was for this reason, known as ‘Gallow Bridge’. There may also have been a gallows in the Middle Ages on the boundary between Burton Extra and Horninglow. In 1757 land off Derby Road was known as ‘Gallows Flat’ which led to speculation that this was the site of a gallows. Gallows also existed at the present day sites of the Derby Turn, Horninglow Road, and at the bottom of Scalpcliffe Road in Stapenhill (now Brizlincote). The latter is thought to be the site of the last hanging to take place in Burton. Stocks mentioned in 1280 probably stood in the market place. The stocks in 1608 were inside the market hall, but later recordings in 1619 and 1708 indicate that they were outside next to the market cross. Stocks were also positioned at Bargates at the Horninglow Road end of High Street. The earliest record of the use of these was in 1610. There were still two pairs of stocks in 1826 but probably only one by 1839, when a pair stood on the Hay near the south-west end of Burton bridge. Burton apparently had a pillory in the late 1570s. This was a wooden framework with a hole for the head and holes either side for the wrists holding the male or female offender so that they could be publically ridiculed. It was only erected when needed. Its last recorded use was in 1739, but I am sure there are still those that would be in favour of its re-introduction! There is a Burton cuckstool mentioned in the 1590s; this was a form ‘ducking stool’ often used as a punishment for a nagging wife; I have not yet managed to establish its whereabouts. There was also a whipping post in the early 1610s to which offenders were strapped to receive lashes on the back. A new cuckstool was made in 1711, when there was still a whipping post in operation. A wooden cage was made in 1622 and stood in the market place serving a similar role to pillory stocks where prisoners could be publically displayed where they could be taunted and ridiculed. Its last recorded mentioned was in 1720, when a payment was made for its removal, suggesting that it was in use until around this time. There seems to have been a secure place of detention in Burton by the mid 1270s. It is recorded that a man who had committed murder in Alrewas was brought to Burton for detainment. In the early 1300s, there was a secure lock-up in Burton market place called ‘Helle’, no guesses for guessing what its nickname was. Although occupied by a townsman, it is likely that offenders were retained on the Abbot’s orders. There was a prison in the mid 1550s, and repairs to the town gaol were made in 1641 and again in the late 1680s. What was called the Jail House or Prison House in 1762 stood at the south east corner of the market place. Together with the adjoining bowling green. It was let that year as an inn but the landlord had to agreed to guard prisoners in a cell and would be accountable to the lord of the manor if a prisoner escaped. Although still used as gaol in 1792, the building was let in 1795 to a brewer, John Sherratt, who used it as an inn, which later became known as the Bowling Green. It was demolished in or shortly before 1834, when a house called the Priory was built on the bowling green itself. There is a ‘black hole’ lock-up mentioned in 1718. This is thought to have been on the same site as the 14th-century ‘Helle’. It was intended for temporary detention; a boy is known to have been detained there for a period of seven days in 1736. It was still in use in 1789. Until 1729 the nearest house of correction to Burton was that at Walsall. One for Burton parish licensed that year was opened in part of the workhouse in Anderstaff Lane (now Wetmore Road). The Burton house of correction is last recorded in 1738, and may have been closed soon afterwards in order to avoid the implications of the 1740 Vagrancy Act. In the late 1840s petty sessions were held weekly in the Angel Inn and by 1851 in the combined county court house and police station at the corner of Station Street and Guild Street. Borough magistrates were first empanelled in 1887, meeting weekly in the same place as the petty sessions’ justices but on a different day. 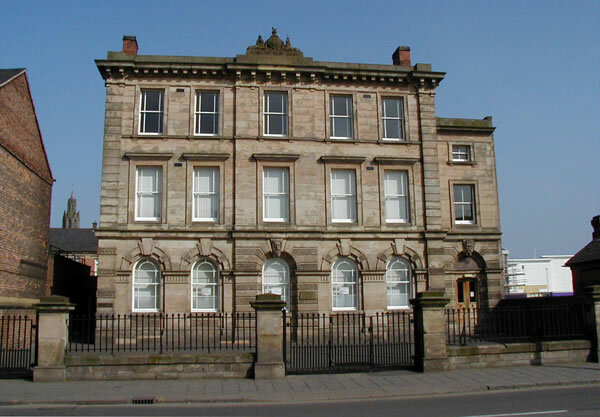 Sessions were transferred in 1910 to a newly built impressive magistrates’ court house in Horninglow Street. At this time, six strokes of the birch was common for such crimes as ‘stealing food’. A separate quarter sessions for the county borough was granted by royal charter in 1912. It was abolished under the Courts Act, 1971, but Burton remained the meeting place for petty sessions. 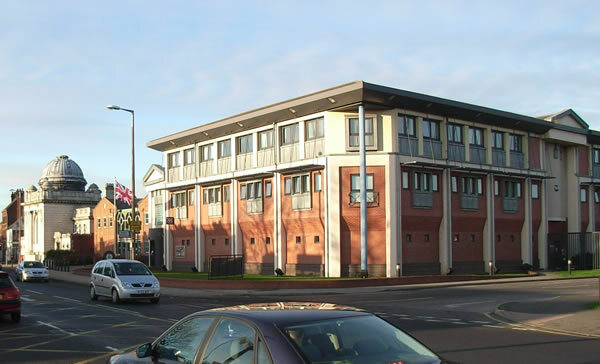 An office block for the magistrates and their clerk was added to the court house in 1991. By 1585 a weekly court of record for the recovery of debts, called the Genters court, was held on Fridays. Apparently still held in the earlier 18th century, the court later fell into disuse but had been re-established by 1794, when it was styled a court of requests. The upper limit of debts within its competence was 40s. in 1841, when it met every three weeks. The court apparently still met in the mid 1850s, although its function had been taken over by a county court held in Burton from 1847. From 1848 the County Court met in a building also used as a police station at the corner of Station Street and Guild Street. 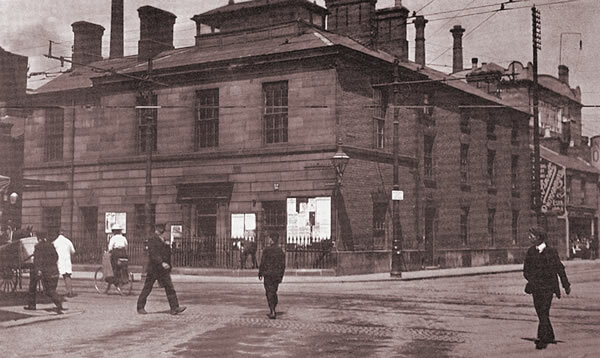 The present Court Court House in Station Street, pictured below, was built in 1862. All a long way removed from the present day magistrate’s court.